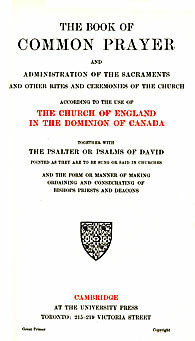 This is the first Book of Common Prayer for the Anglican Church of Canada (then known officially as "The Church of England in the Dominion of Canada"); prior to this the 1662 BCP of the Church of England was used. It is generally a very conservative revision of the 1662 BCP. Very little was changed in the main services (Morning and Evening Prayer, the Litany, and Holy Communion), although a number of occasional services were added, as may be seen in the Table of Contents below. The main reason for the lack of substantive change from the 1662 BCP was disagreements between the "low church" and "high church" parties. The high church party wanted a revised eucharistic rite along the lines of the 1549 liturgy (much as later appeared in the C of E 1928 BCP), while the low church party wanted to keep the 1662 with few, if any, changes. The result was that very few changes were made. Further information on the development of this book may be found in The Oxford Guide to the Book of Common Prayer, p. 186ff. A 1914 draft of this book is online from the Internet Archive. This Book, while agreed to in 1918, was not authorized for use until Easter, 1922. It was in use in Canada until a revised BCP was issued in 1959. Like American BCP's since 1892, the pagination in all printings (nearly all of which were all done by the Cambridge University Press) is identical. The original copy used here is a large and fairly elaborate printing, probably intended to be used as an altar book. The pages measure 29 x 19cm, and rubrics are in red, rather than the usual italics. It appears in David Griffiths' Bibliography of the Book of Common Prayer as 1922/2. The PDF files below are intended to duplicate this book as closely as possible. * In official copies and in desk copies.